Are you like me? Have a bunch of household alkaline batteries sitting in a dusty section of your garage since you can’t bear to throw them out? You know. The ones that power your radios, flashlights, and other electronic equipment? If you don’t live in California, which mandates that all batteries must be recycled, then your batteries could be bound for the trash. That’s a whole lot of wasted metal and toxic chemicals going into a landfill. So learn where you can recycle alkaline batteries. A couple of years, I was told by my county recycling that I couldn’t give them my batteries anymore due to the battery mercury phase out program. They told me to throw them in the garbage. In the garbage? Are they crazy? I don’t throw things in the garbage. Those darn batteries are made of metals that can be re-used. What about the other Chemicals in the Alkaline Batteries? In 1992, 101, 400 tons of alkaline batteries were sold in the US. Can you imagine what that number is today? Rather yet, can you imagine what the number is all over the world? The sad part is Alkaline batteries contain heavy metals which can leach from landfills and contaminate our groundwater. Recycling of batteries is imperative. Anna, okay. How Can We Recycle Alkaline Batteries? Some of the Battery Plus stores take back the batteries as well as other batteries. Each store has its own policy so call ahead before you arrive with your batteries. The website has a easy store locator. See here as to what they recycle for free. Two out of four stores I called took them back. One store said the first 3 pounds are free and thereafter, it will cost you 99 cents per pound. Nancy at Battery Recycling told me that a pound is about 18 AA batteries. (More on Battery Recycling below.) Another store had a 99 cents policy for any amount, but said that if you bring them a baggie of batteries they won’t charge you. 2. Check if your City has a program. The City of Chicago has a alkaline and rechargeable battery take back program. Batteries can be dropped off at any Chicago Public Library or Walgreens Drug Store. Check the website for periodic updates. Residences and businesses can purchase iRecycle Kits ranging from $24.95 for a 5 pound kit to $79 for a 55 pound kit. However, if you collect a large amount such a mid-size business, city, or school, contact the company to learn about their Smart Recycling System. If you live near their facilities (Howell, Michigan or Mesa, Arizona,) you can drop off the batteries. However, you will incur a charge for the weight of the batteries. In addition to collecting batteries, the Company accepts a variety of other materials for recycling. See here for more information. The Company has been collecting batteries and re-processing them since 1971. See here for more information about how they reprocess the batteries. How about Battery Recycling in Other Countries? 1. Europe: In 2006, the European Union made batteries recycling compulsory in 2008 . By 2012, 25% of all batteries purchased must be collected with an increase to 45% by 2016. The cost of collection is borne by the producers which includes the maker of the equipment that contains the batteries. 2. Australia: See here as to information about recycling your batteries. Also, check Recycle Near You. 3. China: Information about battery recycling in China. The article is simply a starting point and does not give a definitive place to find out about recycling. 4. Canada: You can purchase a battery container from Raw Materials. In addition, Amber of Srocel.com told me that you can recycle your batteries at Rona hardware stores. Can you add another place which takes back alkaline batteries? I would like to list as many international sources as possible. Have you brought your batteries to any of the above locations? Would you recycle your batteries? How many of you use rechargeable batteries and if so, which brands do you like? Also from Canada and where I live we can take them to the local landfill for recycling. My work also allows employees to bring them in for proper disposal. 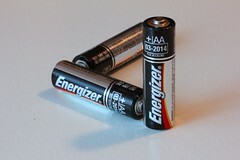 As of January 2012, the City of Chicago no longer accepts alkaline batteries. I am seeking an alternate drop-off point. Did you call your local Battery Plus stores. I just dropped off a bunch at one of mine. Note, not all stores take them back. Its now become necessary for everyone to take care of the environment. thanks for the depth info about battery recycling.